This is Jacintha. She’s about seventeen years old and she has a hole in her heart. She is weak and not able to perform simple tasks due to lack of energy. She is one of the fourteen children living with Uma and Sampath. While Roger was in India he was able to arrange for Jacintha to travel to Bangalore to have heart surgery in a top-notch cardiology hospital. We were so excited at the possibility. But when Roger got home and we tried to make the arrangements, we found out that Jacintha’s mother is hesitant to have her daughter travel so far away from home. She elected to have the local hospital do the surgery which has been postponed several times. When we travel and work in India we want to always do good and never do harm. Would we be willing, in a similar situation, to have a stranger arrange for our precious child to travel somewhere that seems like a million miles away to be treated by an unknown doctor in an unknown hospital? Maybe not. Jacintha went in earlier this week to have the surgery, but it was found that she had an infection and was placed on antibiotics. All we can do is pray that the local doctor is well-trained and that God guides his hands. Will you pray with us for Jacintha’s healing? I was going to title this Divine Appointments or Blessed Encounter and then I decided I need to curb my tendency to speak in Christianese. It may be understood and appreciated by some, but not all. So I just called it Surprises. During Roger’s five week trip to India I saw that a writing friend, one I’ve never met but follow because she and her husband work in India, had a health crisis. While traveling on a twelve hour bus ride, Holly’s husband, Bishop Leo Michael came down with Dengue fever. Dengue fever is serious and is contracted through mosquito bites. 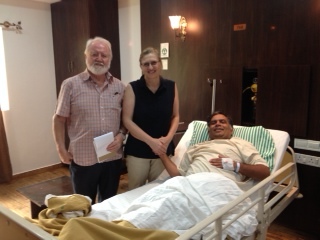 By the time a very worried Holly got Leo to the hospital in Bangalore he was near death. He had a high fever and was severely dehydrated. Imagine how Holly felt. Her husband was too sick too respond, she was a stranger, unfamiliar with the land they were traveling through and unsure what to do. Roger happened to be in Bangalore at the same time the Michaels arrived there and Leo was admitted to ICU. Holly spent the first night in the hospital not allowed to visit and knowing her husband was near death. By the second day he was stablilized. Roger was able to visit on the third or fourth day when Leo’s blood count was improving and they knew he would get well. I wish Roger had been there to be with Holly on that first night, but when he and Chad visited, Roger was overcome with emotion for this brother and sister (I did it again) whom he’d never met. The entire event surprises me. Why did Roger and Chad’s path cross with these two? It doesn’t really matter why— it was just a great big happy surprise that two men could comfort and pray for a sick man and his very worried wife. I’m so glad it happened. In the middle of so many dark and disappointing happenings in our crazy world, this one makes me smile. Roger has been all over India from top to bottom. He began in Delhi where he spent about ten days in meetings with a local ministry. Then he went to Hyderabad where he met Chad Oathout. He and Chad met with several of our friends in the Hyderabad area and also visited Dayanilayam orphanage two hours away. Chad was able to meet a young man he and his wife Jill sponsored from the time he was about ten years of age. He is now a high school student and doing well. Then they went north by car to visit a pastor and his wife, visited two students who are daughters of one of our pastor friends and then took a train to Chennai to visit the Baby Girl Home. Now they’re in A.P. with friends. 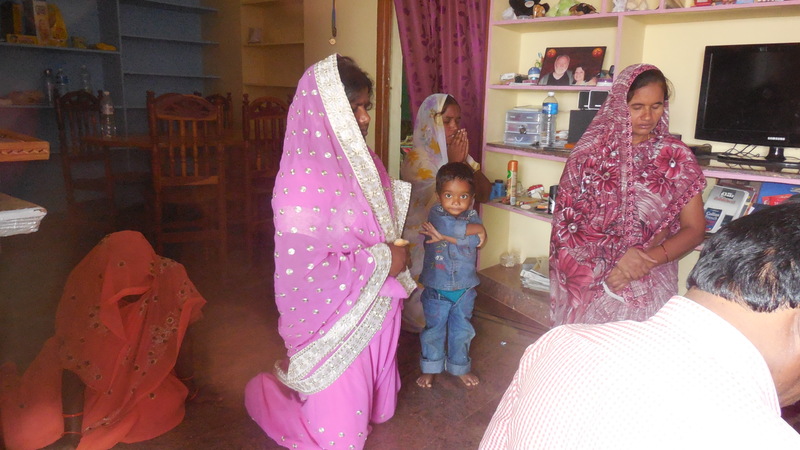 This picture is the living area of the home where church services are conducted. If you look closely you’ll see a picture of Roger and I on their shelf. Roger and Chad will go to Bangalore to visit my daughter in law’s parents and then home. Roger flies home from Delhi, Chad from Bangalore. They will have lots of stories to tell. It’s always exciting to get updated news from the people we support through Teams India. Children grow up and begin to minister with their parents, new house churches form, land is purchased and new homes constructed. The intensity and dedication of the believers comes through loud and clear. Even little children take part in worship with abandon. I can’t wait to get the reports when Roger gets home in about a week. Look for a video on facebook showing a meeting taking place in one of the pastor’s homes last year. 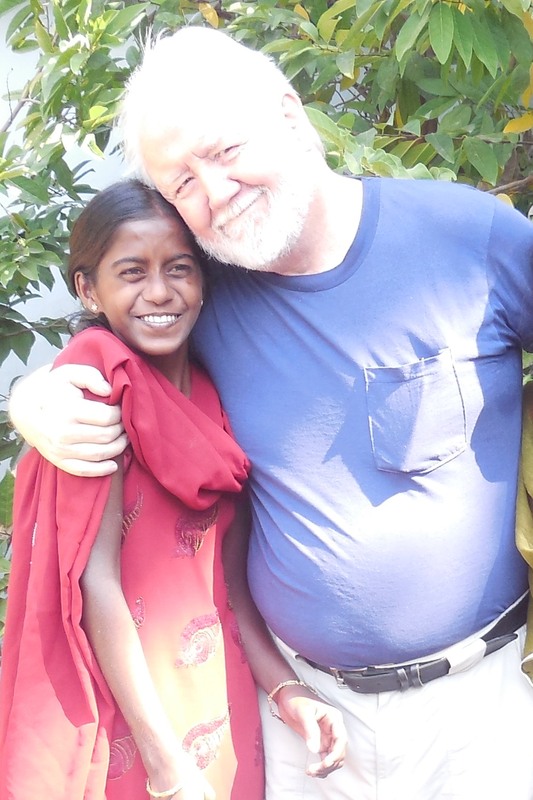 Roger first met Akanksha at Dayanilayam orphanage near Hyderabad in 2005. She had been left as a “ragpicker” at a local dump by her aunt. She was brought to the orphanage dirty and without real clothing. She had lived at the dump for three or four years by then and was about eight or nine years old in 2005. She was afraid of Roger, but polite as she was taught to be to Americans who might sponsor her. We saw her each year when we visited the orphanage and bought her little presents from time to time. She was allowed to travel with us when we were in the area and we treated her to her first ice cream when we took her to Hyderabad. She saw stairs and elevators for the first time and also her first airplane. When she was about 14 she ran away from the orphanage and married her first cousin. This was a marriage match made at birth by her Buduga Jangam tribe. The tribal people are outside of caste, even lower than dalits, and her group made their living by weaving mats, traveling from village to village to sing and bless or give curses and they often ate birds and rats. More recently the adults from this group have become day workers in the fields. When Akanksha ran away we thought we had lost her, but through another cousin we were able to find her about four hours away from the orphanage. She was living with her new husband and his parents in a dwelling put together from plastic, boards and other rubble. It broke our hearts. We gave Thomas some money and told him to use it for education. He promised he would. We were so happy on our next visit to find them at a Bible School near Hyderabad. We visited them and met their teacher. Later we heard Thomas was becoming a pastor and had received further training. In 2010 when we were in Bangalore for our son’s wedding, Thomas and Akanksha came to the service with their newborn son, Paul. That was four years ago. 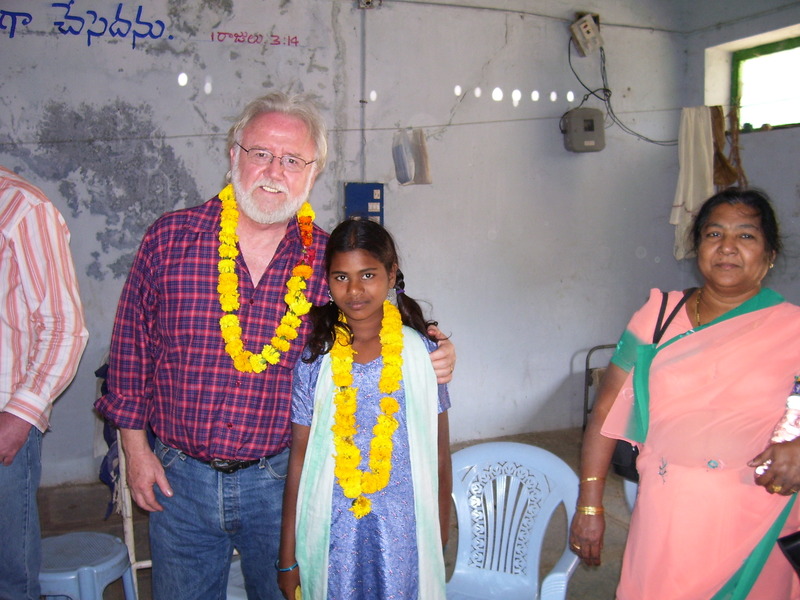 This weekend Roger will visit Thomas and Akanksha in Nalagonda where they live and work. Both are Christian leaders and they now have added a daughter to their little family. God raised these two young people from beggars to Christian leaders. We couldn’t be prouder. 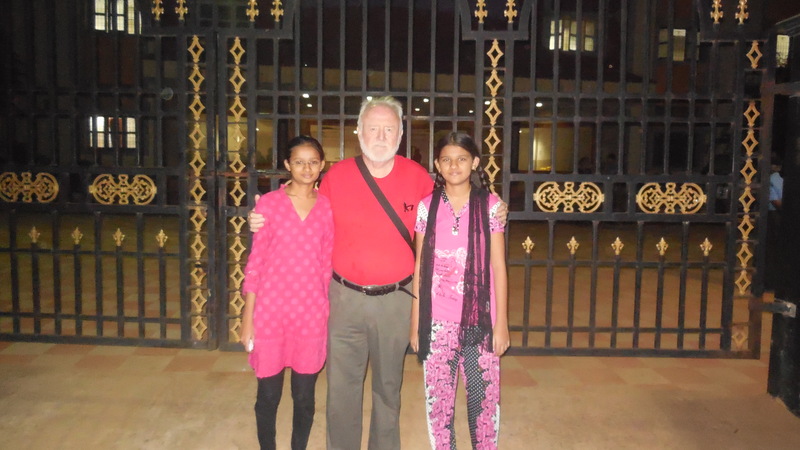 Last year when Roger went to India he was able to visit a pastor’s daughters, at their school in an eastern city. Teams India has supported the education of these two girls since they were very young. Both are top students in pre-med training. Coming from the Banjara tribe, the original gypsy people, their chances of gaining a good education were very small, but now both of them will become doctors and return to serve their people and support their parents’ ministry. Their young brother (little Roger) is coming up behind them and is also a strong student. These children, plus the young women who graduate from a local Bible College and so many others we support who love God–these are our prizes, our treasures of eternal value. We’re glad we can feed the poor, offer medical help, even build buildings for Kingdom work, but we’re most proud to help provide an education to godly young people who you and I will meet one day in eternity. 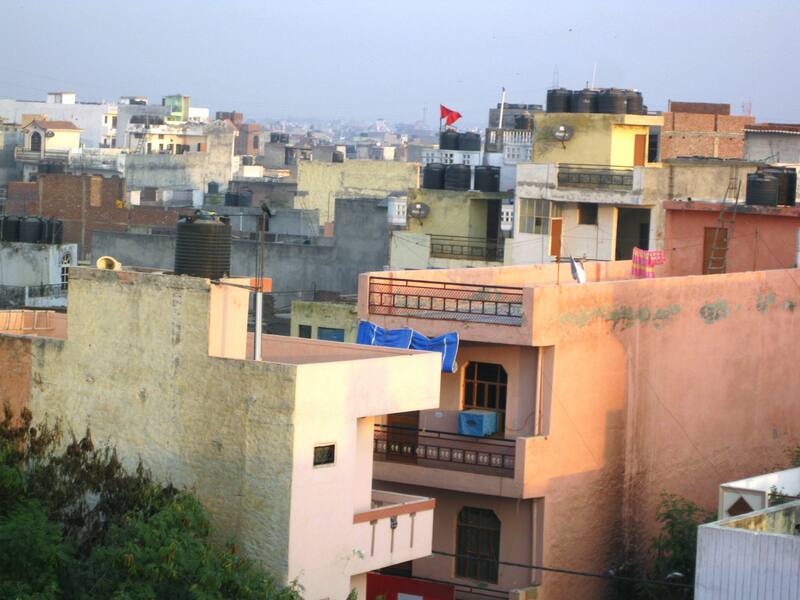 If you want to experience life in the big cities of India, go back to my post in Letters from India, 2009 entitled Up on the Rooftop. The rooftops of the homes are my favorite places. Inside Indian buildings it’s usually dim–lightbulbs are energy-saving and there aren’t many windows. But on the rooftops you’re in natural lighting and you can see so much. You can sit and sip tea and watch the daily life of the people unfold before you. I often feel as if I’m intruding, but no one is hiding. I’ve watched bathing, hair washing and braiding, food preparation, and once a major brawl between two young girls–made me think of professional wrestling except this was for real and rather unsettling. Roger reports there are now about 1200 guests for the gathering, including Christian leaders and local secular leaders. He is speaking each evening and is being courted by local officials who want to have their picture taken with him, want to take him to dinner and show him the city’s “best whiskey.” The meetings are finished tomorrow and then I’m sure he’ll take advantage of some more times of rest. The jet lag comes and goes. I mentioned the poor harvest this year in A.P. and the ensuing suicides of farmers caught in so much debt they can never be free. It’s an annual problem, but is always worse in times of drought. Thought I’d share a video (look on Facebook) Roger got last year of the people threshing rice from the stalks. Sometimes they have machinery to help, sometimes oxen tread on it. Sometimes the people place the stalks on the road and let cars do the work and other times women do it the old-fashioned say. Such a basic form of work–gathering in the crop to earn daily wages. Please continue to pray for health and safety and that Roger will get enough rest in that heady environment. Roger arrived in Delhi Saturday afternoon after a trip that took him from Portland, to Seattle, to Inchon, South Korea and on to Delhi. He had only slept for three hours when I first talked to him, but he was pumped up on adrenalin as he’s going to speak to over 800 leaders who are gathered for a five day training. He’d been studying before he left, and reports that the three messages he will give came together then. They’re exactly what Rodrick wants him to preach on, so the Holy Spirit has gone ahead of him. Today he reported he’d slept for ten hours and was feeling more alive. On a sad note there has been drought all over Andhra Pradesh, the state Roger will travel to later in the trip. Over two hundred farmers have committed suicide because their crops have failed. While it seems impossible to us, this is a very common occurrence in India. Farmers go into debt to buy seed, pesticides and other things they need to plant their fields. Since most of them don’t have bank accounts, they use private loans taken from local loan sharks. They are extremely immoral people who prey on their friends and neighbors. They charge very high rates of interest to the point that even with a good crop the farmer may not be able to pay it back. If the crop fails as they are this year the men become despondent and drink pesticides to kill themselves. The government is trying to approve a plan in which most people would have access to bank accounts and could take out proper loans with reasonable rates of interest. We pray that happens soon. When I close my eyes I can pretend I’m on the rooftop of Rodrick and Neetu’s training center. There is a view across miles of Delhi that is quite breathtaking. Roger will be drinking fragrant cups of chai and eating all sorts of great Indian food. I have to admit I’m jealous. Please continue to pray for health and safety and wonderful times with the people God has brought into our lives. Roger and I have personally witnessed the poor bringing their rice offering to church services. They bring it in bags, on paper plates and sometimes young children bring a few grains of rice in their hands to drop into a wooden offering box. I’ve heard that women all over India save out a handful of rice to give to the poor. It’s a tangible way of measuring out love and care for those less fortunate. When we began our Teams India work and our One Handful of Rice blog, the idea was the same: if people everywhere took out just a little, just a handful, and gave it to those in need, our projects in India could be accomplished. We still believe that. Roger leaves for India on October 17th. Our partners there have basic needs– food, medicines, shelter, clean water and education so the next generation can move out of poverty. We work with those who share the gospel of Jesus in both traditional churches and in house church models. They care for the handicapped, the elderly, those with HIV/aids, orphans and those who don’t have enough for even one meal a day. Let’s go back to basics. Can you spare a handful of rice a day? If you can, then you can say with the believing poor of Mizoram, “We have something to give to God.” It’s easy to support Teams India by clicking the donate button on the home page. Your gifts can be small, just a handful. 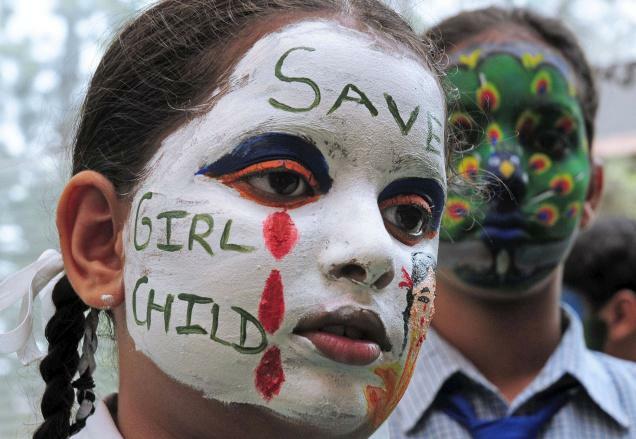 The Hindu newspaper reports that more than three million baby girls died in India between 2001 and 2011. The statistics are grim, but this “alarming trend” is nothing new– baby girls have been killed at birth or in the first months of life for generations. The number of female deaths is rising along with the rising costs of weddings and the dowry required. Parents of baby girls face a life of poverty. When their daughters reach marriageable age, the family will be required to pay the equivalent of many years’ income to the family of the prospective husband. Women in villages all across the country find it easier and more practical to kill their baby girls. No one in the extended family is happy when the family returns from a clinic or hospital with a baby girl. So the baby quietly disappears or the family reports she died at birth. Today in the state of Gujarat there are fewer than 800 girls for every 1,000 boys. There aren’t enough young women to enter into marriage which has spiked the number of kidnappings of young women from neighboring countries. As widespread as this problem is, little is being done to stop the practice. In an effort to build awareness and stir government leaders into action the country celebrates International Day of the Girl Child. The picture above says it all: tears of blood and a plea to save the lives of baby girls. You can help. Go to www.girlbabyhome.com and read about the work of Russal and Kumari Raj. They rescue baby girls and extend their love by making them part of their family. The Girl Baby Home is currently in the process of being licensed by the government to house and care for more baby girls at risk. Read about their struggles at the website. 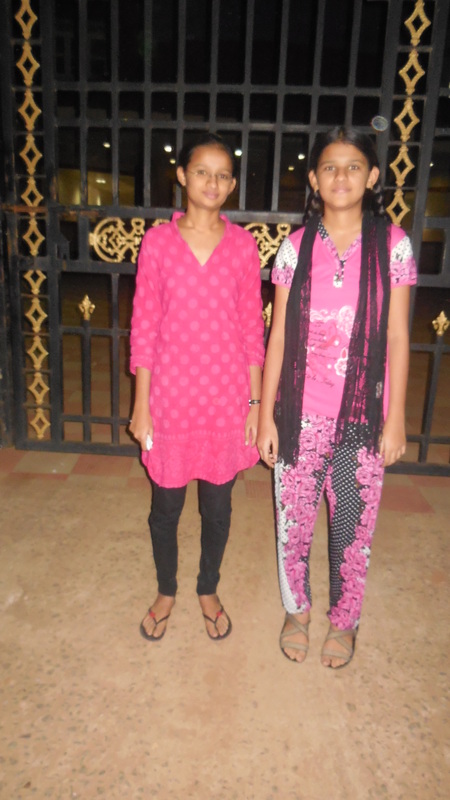 April and May are summer vacation in India. These are the hottest times of the year. The new school year begins in June. Government schools in India are free, but even poor families try to save money to enroll their children in better schools. Many women join saving clubs to help them with the tuition, uniforms, books and materials required for children to attend a better school. The cost of a reasonable education for the poor is about $300 per year. Here are two ways you can help a poor child attend school next year. 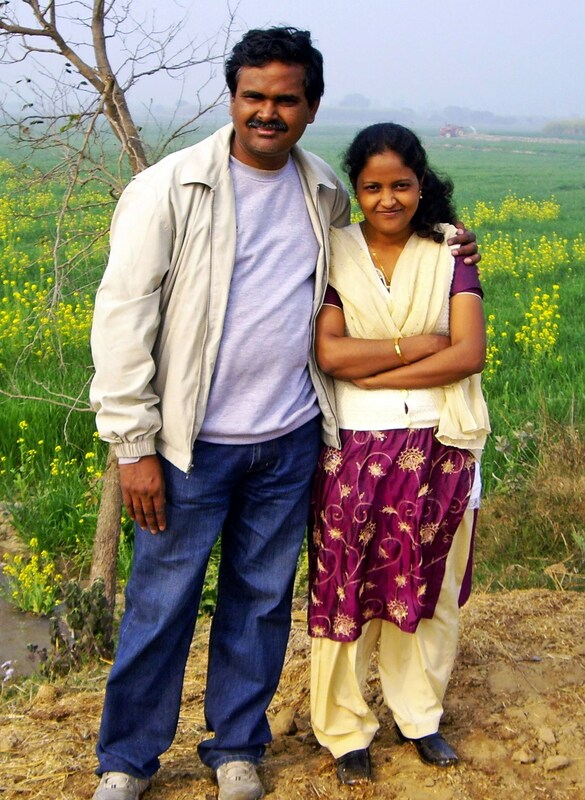 You might want to help Russal and Kumari Raj put their ten oldest girls in school for the coming year. Russal and Kumari run the Girl Baby Home (www.girlbabyhome.com. )They have rescued fourteen girls from death and are raising them as their own. Ten of the girls are old enough for school. Go to their website to see how you can donate. Or, you can give through Teams India on this website. Designate your money for education and we’ll see that it goes to an Indian ministry helping children to attend decent schools. In America we take a free education for granted. In India it is a great privilege to go to a good school with good teachers. Even the poor are willing to pay out of their small incomes to give their children this chance to learn and improve their lives. Make your day–provide a chance for a poor child to attend school.